All the candidates at the forum on Environmental Challenges presented by SOCAN on Monday October 1st agreed that climate science is real, but they disagreed on what to do. Attending the debate were Jeff Golden and Jessica Gomez candidates for Senate District 3, House District 5 incumbent Pam Marsh, and House District 6 candidate Michelle Blum Atkinson. The panel of candidates seeking to represent us in Salem at the Southern Oregon Climate Action Now Forum was dominated by Democrats because, among Republicans, only Jessica Gomez chose to attend. On climate change, forest issues, and other environmental issues, there were obvious differences of opinion. On addressing global warming, for example, Golden, Marsh, and Blum Atkinson expressed support for meaningful greenhouse gas emissions reduction policy in the state. House District 5 Representative Pam Marsh touted her leadership in Salem in promoting such legislation. Jeff Golden, candidate for Senate District 3, meanwhile firmly supported legislation that demands substantial emissions reductions and expressed concern that any proposal developed should be sufficiently rigorous that it really addresses the problem. Indeed, Golden identified environmental concerns as the primary reasons for, and corner stone of, his candidacy and argued Oregon should assume a leadership role in addressing the problem. House District 6 candidate Michelle Blum Atkinson identified environment as one her priorities, and committed to supporting climate action. While accepting the science and the problem, Republican candidate for Senate District 3 Jessica Gomez voiced her disagreement with the Democrats. Gomez, scoffed at the idea that we are facing ‘climate chaos,’ suggesting this is merely frightening language. To address the issue, she argued for more research, complained that the cap and trade proposals are too complex, and suggested that a global solution was necessary. Gomez reflected the standard Oregon Republican caucus position that Oregon’s contribution to the global budget of emissions is so small that state action is unnecessary because it would have a trivial impact. Gomez also raised the specter of the Business Energy Tax Credit (BETC) problem of several years back, again echoing Republican criticisms. Climate action champion Marsh dismissed that claim by pointing out that the Clean Energy Jobs proposal is totally unlike BETC. The inference drawn is that Gomez would not support meaningful action on climate change while Golden, Marsh, and Blum Atkinson would. Addressing the blight of our summer, forest fires, the Democratic candidates all accurately related the problem to climate change induced by global warming and fuel- build-up from fire suppression. They argued for a program of thinning the forests and reintroducing controlled fire. Jessica Gomez, meanwhile, primarily touted the standard party line that the problem is mainly a result of environmental regulations and the reduction of logging in the 1980s. Answering a question about how well their positions reflect their party’s priorities, the Democrats argued generally that they support the state party platform. Golden stressed the need for action on environmental issues that is generally stronger than the party platform while Marsh expressed appreciation for that platform, and Blum Atkinson argued her strong opposition to the Jordan Cove project. Meanwhile, despite offering the standard Republican position on most issues, Gomez claimed she does not follow the party line. In response to audience questions, there were less clearly articulated differences. All agreed the state should help promote resilience to climate change, though Gomez argued it was more a local than state issue. In relation to reducing land-fill use and promoting recycling, all were in favor of ma. king recycling easier: Golden encouraged incentives to reduce packaging, Marsh supported a plastic bag ban and Blum Atkinson argued for eliminating plastic bags. Gomez, meanwhile, argued in favor of producing natural gas from garbage as an insurance policy against the likely earthquake. In terms of protecting the most vulnerable communities from toxins, all agreed for the need to do this. Finally, in response to a question about how to prevent a cap and trade program for allowing banks to profiteer from the sale of permits, all but Gomez argued that the way the bill was written and administered could address this potential problem. Only Gomez used this as an excuse to argue against the proposal. Overall Golden, Marsh and Blum Atkinson generally argued for the need for climate action, forest management that acknowledges the rile of fire suppression and climate change, and environmental protection at least the equal of their party’s platform, despite offering the standard Republican position on most issues, Gomez argued that she does not follow the party line. SOCAN co-facilitator and forum team leader Alan Journet noted that all candidates for these races were invited, with most of the Republican candidates being offered the option of selecting a date that was convenient to them. 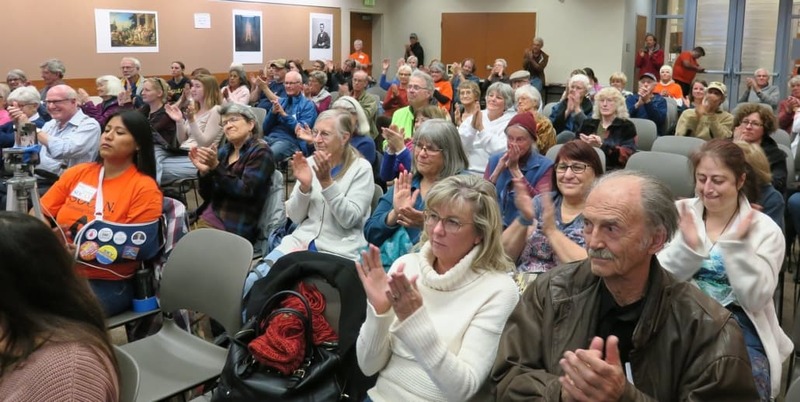 “While we learned much about where the candidates in attendance stand, it’s unfortunate that most of the Republican candidates considered environmental challenges of so little importance that they chose not to face their voters on the issues,” Journet concluded. On Monday October 15th SOCAN will again offer a forum on environmental challenges, this time for candidates seeking to represent residents on the Jackson County Commissioner.